Minister Jeyaraj Fernandopulle addressing the news conference. 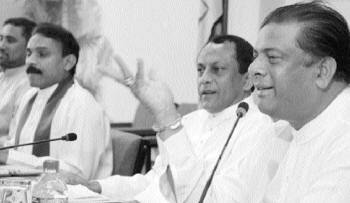 Ministers Lakshman Yapa Abeywardena, Hemakumara Nanayakkara and Rohitha Abeygunawardena are also in the picture. The Government yesterday termed the approval of six supplementary estimates with a majority in Parliament on Tuesday as a “major political victory” and a successful defeat of a UNP devised plan to topple the Government with the help of JVP and the TNA. Member of Parliament Mangala Samaraweera yesterday said he will continue to be a member of the Sri Lanka Freedom Party (SLFP) and act according to its policies despite crossing over to the Opposition on Tuesday. It is not surprising that former ministers Mangala Samaraweera and Sripathi Suriyarachchi decided to sit in the Opposition as they were mentally in the Opposition for the last few months, Minister Jeyaraj Fernandopulle said.